Who are these people who think I remove my makeup with a chisel? You need something way more gentle than that, especially if you have sensitive skin like me. I even find drugstore brand makeup wipes too harsh for me. Y’all know I can’t handle much without reacting. Haha. Neutrogena and Clean & Clear wipes often sting my eye area and/or leave my skin feeling tight and dry. Tarte understands my sensitive, acne prone skin type. As you may know I’m a huge fan of their Maracuja Oil, so when I found the oil in a wipe form I was pretty stoked. 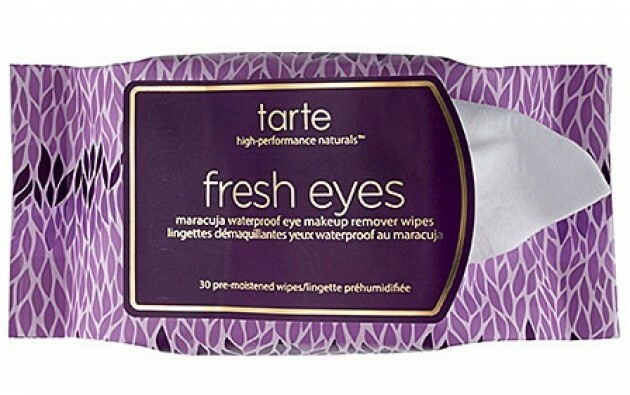 Fresh Eyes Maracuja Waterproof Eye Makeup Remover Wipes are designed to take off eye makeup, BUT I use it to take off all of my makeup. At $12 they’re a couple extra dollars than your average removal wipes, I find them worth it because they’re so gentle and help retain the skin’s moisture. I love Tarte cosmetics too! (Their maracuja oil for the face is like liquid magic.) Anyway, I tracked down your site because I wanted to send you a note about the whole crying-a-lot thing. (Feel free to delete this later since it has nothing to do with your beauty blogging.) Watching you on The Bachelor was like watching an old video of myself. In all seriousness, I thought I was a highly-emotional, deeply sensitive girl and that my habitual crying was just a part of who I was. Also, I really WAS emotional about whatever it was I was crying about; I had good reasons to be upset. I have a point, though. I went off birth control and it completely changed my life. I realize that it might be silly to think you’re on Lo Estrin (or something similar) since you’re a virgin and all that, but plenty of women take the pill for other reasons. Once I stopped taking the pill, my ability to control my emotions completely changed. Now when I feel like crying, I can actually will myself to NOT cry. And if I’m crying, I can stop. It’s so wonderful. Being in charge of your own emotions is really wonderful and I just wanted to give you something to think about. If you’re ingesting synthetic hormones (i.e. birth control) into your body, it could be dramatically influencing how you respond to things on an emotional level. If you’re not on the pill and are naturally just that emotional, then good for you for being yourself. I hope you don’t find this message offensive in any way; I just wanted to let you know that there are other women out there like you and that you have options! I am on Ortho Tri Cyclen bc of my skin, but I’ve ALWAYS been a crier haha no offense taken! I have the same issue with makeup remover wipes stinging my eyes, but I find the Neutrogena ones in the tangerine-coloured packaging (has to be those ones, not the ones in the blue package) work.